(CNN) -- An American physicist and two physicists from Japan will share this year's Nobel Prize in Physics, the Nobel Foundation announced Tuesday. 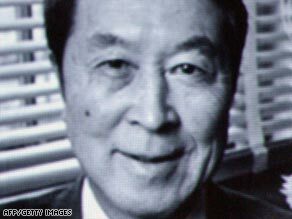 Chicago-based Nambu won a half-share of the Nobel Prize in Physics. Yoichiro Nambu of the University of Chicago will take half the prize for "the discovery of the mechanism of spontaneous broken symmetry in subatomic physics." Makoto Kobayashi of the High Energy Accelerator Research Organization and Toshihide Maskawa of Kyoto University will each receive a quarter of the prize. They were cited for "the discovery of the origin of the broken symmetry which predicts the existence of at least three families of quarks in nature." The 514-member Royal Swedish Academy of Sciences selects the Nobel laureates in Physics from a list of candidates prepared by a special committee. Committee members consult expert advisers to select the candidates, who have all been nominated through formal letters.